The Restigouche Tourism Association (RTA) has been awarded the 2009 ACOA Tourism Atlantic Technology Award for successfully engaging technology to enhance the travel experiences of visitors to New-Brunswick. This association significantly improved an outdated website to maximize its regional marketing and promotional efforts. As part of the Website upgrades, RTA has developed a new four-season inspired logo and slogan for the region. As a creative touch, the colours of the website have been programmed to change with the seasons. The redesigned site is now better positioned to act as the principal source of information for the Restigouche region. 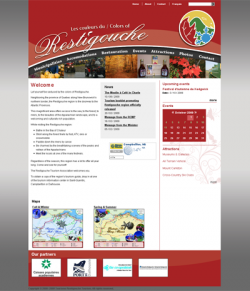 As well as winning the ACOA Tourism Technology Award, the Destination Restigouche website has been posted as the Website of the Month of July on the TIANB home page. We, PLC info northStudio Atlantic, are really proud of helping the Restigouche Tourism Association in building a Website that won this major Technology Tourism Award for Atlantic Canada.